Where have you seen the '5 ticks' lately? On any typical day, you would come across the mark of safety, quality and excellence in a variety of settings - the glass in your train on the way to work, the helmet that you wear when bike riding, the baby capsule that you put your baby in. When you see the SAI Global "Five Ticks" StandardsMark on a product, you know that the product meets a particular Standard and that this has been audited by a company that you can trust. The "Five Ticks" StandardsMark has over 80% recognition by consumers in Australia, providing manufacturers with a competitive advantage when they have their products certified by SAI Global. The StandardsMark on a product is an independent assurance to the customer that the product has undergone a rigorous audit and testing program. According to ISO/IEC Guide 67 - Fundamentals of Product Certification, product certification is referred to "an activity by which a third party gives written assurance that a product (including process and service) fulfils specified requirements." 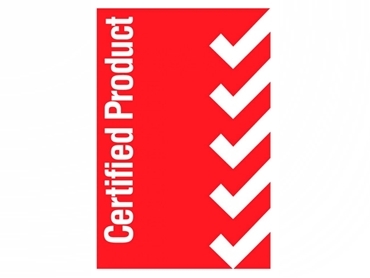 While not all product certification is mandatory, having the correct certification for a product has many benefits for manufacturers. Ensuring quality and improving consumer sentiment are key advantages. Where certification schemes are mandatory and subject to legal enforcement, certification can assist in limiting liability and avoiding prosecution and harm to a company's reputation. A great resource to find a listing of mandatory Standards, can be found at Product Safety Australia. In practice, the StandardsMark scheme for Product Certification is a System 5 certification scheme that requires annual audits of the facility where a product is manufactured, in addition to product type testing according to the requirements of the relevant Standard. Ongoing certification involving factory surveillance audits is also required to ensure that maintenance of the manufacturing process is occurring. Maintenance of the Licence through Surveillance Audits. System 1 WaterMark Level 2 and Type Test certifications. SAI Global has a wealth of experience in this specialised industry with its first Product Certification in Australia in 1965, and a team of expert technical auditors who are also represented on many Standards committees. Next in this series, we will turn our focus to SAI Global's Quality Management System certifications.